Well, what do you know? It’s that time of the year again. Everywhere you look, the song rings true “it’s beginning to look a lot like Christmas!” The decorations are out, and the shops are advertising their deals, and everyone’s talking about the events happening… It’s all pretty exciting! Well, here’s what Fair Life Africa’s got lined up! If you would like to join us in spreading love and joy to the vulnerable children on the streets of Lagos, or even the few lucky ones we have managed to rescue, rehabilitate and reconcile with their families, read on and learn how you can be of help! 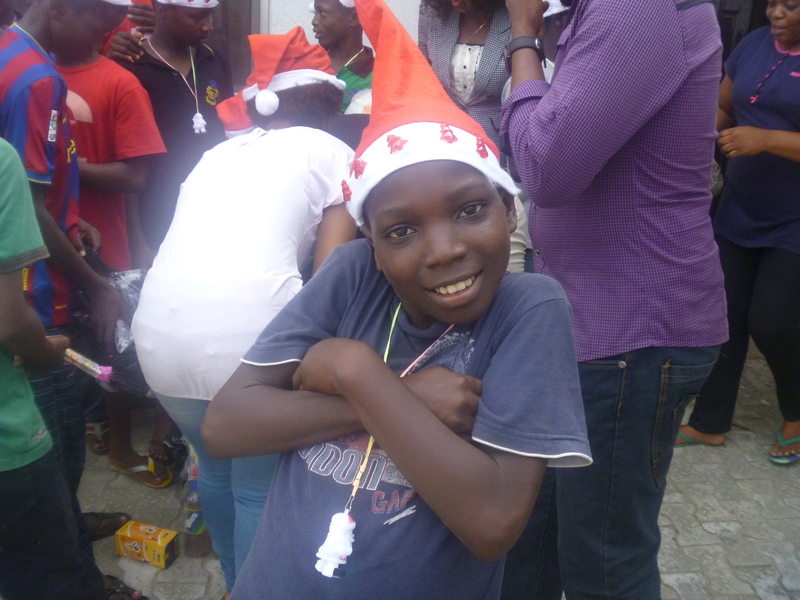 Our Special Christmas Visits kicks off with a road trip to Ondo State to celebrate Christmas with Adam* and his family! Ayo and Ifeoma will be going laden with food provisions for the whole family and clothes for Adam. They’ll be staying overnight, as they will not be able to get there and spend sufficient time with the family, and still return to Lagos in good time. Ayo and Ifeoma will be out on the streets of Lagos, and local beaches, on the lookout for street boys in need of our support. They will be happy to have your support as a volunteer if you can spare the day. Call Ifeoma on 08095821953 to get the full details! Tope and Nishola will be making a Special Christmas Visit to celebrate with Mark* and his family! They will also go with provisions and clothing to share. Our good friends with time on their hands can also volunteer to accompany them. Call Nishola on 08144767324 to see if you can tag along! The FLA Home is open as a Day Centre this Wednesday for those invited from our outreach trips to visit the Centre. Those who attend will be provided with two wholesome meals, and have access to our showers, beds, computers, games and reading rooms, and also receive further assessment to help the process of reconciliation along. We need volunteer Support workers to attend to the boys coming, and skilled professionals to volunteer their time as vocational trainers, tutors in Literacy, Numeracy and IT, mentors and medical practitioners (psychologists and doctors). Can you get involved? Call Ifeoma to know how. Ayo and Tope will head to Ibadan together to make TWO Special Christmas Visits to Derek* and John*, who are back living with their families. They will also carry provisions for the families and clothes for the children too, including some educational gifts contributed by DOAM Foundation! It is another overnight stay to enable us to spend sufficient time with both families, however, if you are interested in joining us on this outing, please call Ayo on 08095821953! Ifeoma and Nishola will be out on the streets on the 19th, still on the lookout for street boys in need of our support. They will be happy to have your support as a volunteer if you can spare the day. Call Ifeoma to get the full details! On Saturday, after his safe return from Ibadan (Oyo State), Ayo will be around to tend to the boys visiting our Centre from places like Mushin, Oshodi, New Kuramo etc. He’ll be supported by Ifeoma. They will very much appreciate your support as a volunteer. Please call Ayo to lend a hand. Christmas Eve!!! We have another outreach outing planned with Ifeoma and Tope to various street locations. It is the last outreach of 2013! So give Ifeoma a call if you are available to tag along. Ayo and Nishola will be making a Special Christmas Visit to celebrate with Andrew* and his family, and will be going with provisions and clothing, as with the other boys. Do call Ayo if you would like to come along. Merry Christmas!!! Yes, we are still open! We are expecting more children to visit from the streets to enjoy the benefits of our Centre, and receive support towards reconciliation. We hope to give each child who attends the Centre a special Christmas gift to make it especially wonderful and memorable for them. Do you have any gift ideas? Call us if you’d like to take part. BOXING Day! Ayo and Tope will be out again to make a Special Christmas Visit to Peter* and his family, bearing provisions and clothes for Peter too. Would you like to join us? Call Ayo to schedule it in. We’ll be making Special Christmas Visits to Tom* and Charles*. Tom was reconciled with his family in 2011, and Charles was reconciled in 2012! We are pleased that they are still at home and will be encouraging them with provisions and clothing too! Care to join us? Call Ayo to make it a date! The Day Centre is Open on this last Saturday of the year! Come and make it a special day by lending your support as a volunteer, or donating gifts and provisions for the children. Ayo and Tope will be on ground to supervise the children. Call Ayo to let us know how you’d like to help out. Christmas is rounding up now, and we still have more children to visit and spread the cheer. Eddy* will receive his Special Christmas Visit from us today! He was one of the boys reconciled in 2012. New Year’s Eve!!! The Centre is open today, so that we can close on New Year’s Day (and give our staff a little break!). We are expecting more children to come in and receive some special loving and inspiration! Can you spare the time to come out and help Ayo and Emeke host them? Please call Ayo to confirm your participation. The last Special Christmas Visit will be to see Anthony*, another one of the boys reconciled in 2012. Though the Season has come to an end, we hope he will still be encouraged by our visit! The Centre is open this first Saturday of the New Year. As before, we will appreciate having more hands on deck so that we can attend to the varied needs the children are likely to present with. So, if you’re not too exhausted from an eventful Christmas, do lend us a hand. Give Ayo a call! That about wraps up the Season!!! You can see our hands are full… Can you lend a helping hand? Do you have a day or two to spare to come to the Centre or join us on Outreach, or attend a Special Christmas Visit with us? CASH: Please donate to Fair Life Africa Foundation at Guaranty Trust Bank account no 0106643687. You can also donate online via GlobalGiving! Please call Tope on 08105375899 if you’d like us to pick up a cheque, thanks. FOOD AND HOUSEHOLD PROVISIONS: Please donate bags of rice, beans, garri, milk, hot chocolate, cereal, toilet rolls, toothpaste, soap etc… If you need it at home, they need it here too! CLOTHING: Please donate NEW and used clothing for us to distribute to the boys visiting, and give as gifts to those back home. Don’t neglect shoes, vests, underwear etc. Thanks! APPLIANCES AND EQUIPMENT: Please donate other useful items like laptops, generators, fans, microwaves, kettles etc. We always have need of these in the Centre, and we can donate it to a family to help them at home or grow their business! And please, don’t wait until next Christmas to get involved or donate. Become a regular volunteer or donor today. Sign up as a VOLUNTEER and/or for reminders as a REGULAR DONOR, and let the joy last all year round. Thank you! FAIR LIFE AFRICA WISHES YOU ALL A VERY MERRY CHRISTMAS! Next Post December’s Newsletter is Out!! !